You’re a fighter, warrior and a person who will never let MS get the best of you. Show the world how strong you are by wearing this Multiple Sclerosis Awareness T-Shirt. This MS Awareness Shirt gives encouragement to anyone facing the challenges of multiple sclerosis, helps to promote awareness during MS walks or events & helps support the MS community. Our MS Awareness Shirt is available on our premium 100% cotton T-Shirts t-shirt, machine washable in youth sizes XS-L and adult sizes S-3XL. 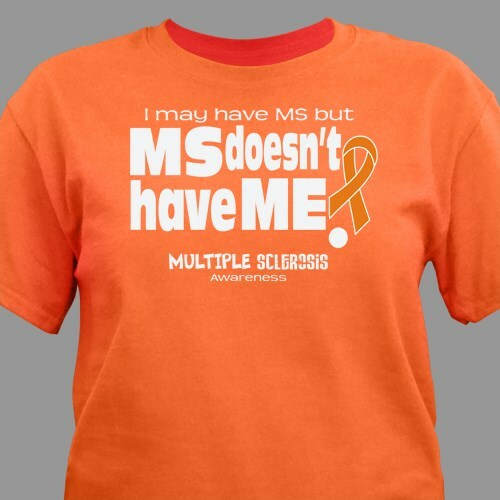 Wear this MS Awareness T-Shirt at your next awareness event! Too fat for for 4 X. hopefully get into them one of these days. Additional Info Multiple Sclerosis affects approximately 400,000 people in the US and an estimated 2.5 million worldwide. By showing awareness, you will help support MS and also help fund research for a cure. Take a look at our entire collection of MS Awareness Walk Gear & Apparel to show your support today! You may also enjoy this great design in our MS Awareness Keychain.